Hired killer Joe (Joseph Gordon-Levitt) checks a golden pocketwatch while standing before a tarp on the edge of a cornfield, a clumsy shotgun-like sidearm called a blunderbuss in his ready hands. At the awaited time, a bound and hooded figure appears, seemingly out of thin air (or thin time), before him on its knees, the blunderbuss fires, and the figure falls dead. Joe stashes the silver bars strapped to the person’s back and discreetly disposes of the body. He returns to his city life, biding his time until he has to do it all again. Such is the life of a looper, an underworld assassin in the American Midwest in the year 2044. In writer-director Rian Johnson’s rundown, rural-inflected speculative vision of the future three decades hence, time travel intrudes into the fringes of a dilapidated civilization from another three decades forward. For reasons that are not well-elaborated-upon by Joe’s spare narration, hits and corpse disposal are prohibitively difficult in the 2070s or so, but the criminal syndicates (always the consummate innovators) cannot be dissuaded from carrying them out. Their solution is to employ the apparently highly-illegal recent invention of time travel to send the people they wish to dispense with back to a place and time where they can be dispatched with relative ease, and have employed the order of loopers to facilitate the task, under the command of future-world ex-pat boss Abe (Jeff Daniels, looking like Slavoj Zizek in an uncharacteristic orientalist phase). Loopers enjoy plenty of perks for their service, being well-compensated and kept soaked in drugs, women, and other hedonistic trappings of the underworld by their employers. The catch is that, one day, when they least suspect it, they will be asked “close the loop”: the target for execution will be their future self, and they will be given a literal golden handshake (bars of gold rather than of silver) and a 30-year retirement period to be concluded with their own looping back to the past, to be permanently “retired” by their younger selves. It all seems tidy enough, but there are always unforeseen issues with time travel in science-fiction flicks, and Johnson makes sure we’re ready for his wrinkles in time. Shortly after a looper colleague (Paul Dano) fails to close his own loop and Joe gives his friend (in present and future iterations) up to an ingenuously cruel punishment at the hands of the syndicate in order to save his stashed silver, he comes face to face with his own future self (Bruce Willis) on the killing tarp. He repeats his betrayed friend’s mistake and “lets his loop run”, as the jargon of his profession goes, although the Old Joe’s stiff resistance doesn’t make it an easy job for the Young Joe, either. Both versions of Joe end up on the lam from Abe and his legions of black-clad goons, as well as from each other. Young Joe wants to capture Old Joe, finish the job, and salvage his savings and his standing with the people who employ him. Old Joe has a more ambitious, time-spanning mission: track down the boy who will become the powerful, malevolent overlord of the future called the Rainmaker and kill him, thus changing what is, mind-bendingly, his own painful past in the future as well as Young Joe’s future in his own past. Got all that? Hitler’s murder paradox in a slick, peculiar nutshell. Anyway, Old Joe’s vendetta leads Young Joe to an isolated Kansan farm, where a hard-as-nails single mother (Emily Blunt) raises her precocious but unsettling son Cid (Pierce Gagnon) with a quiet desperation that conceals some dark secret. Both Abe’s minions and Old Joe are certain to follow, and Young Joe settles in with the bizarre, dichotomous family unit to await the inevitable siege. I ordered a chocolate milkshake, NOT vanilla! And where’s my whipped cream? Writer-director of the crackerjack indie Brick, which cast Gordon-Levitt in a hardboiled detective noir set incongruously in a California high school, Johnson returns to critical form after the mixed reception of his second film, the caper flick The Brothers Bloom. 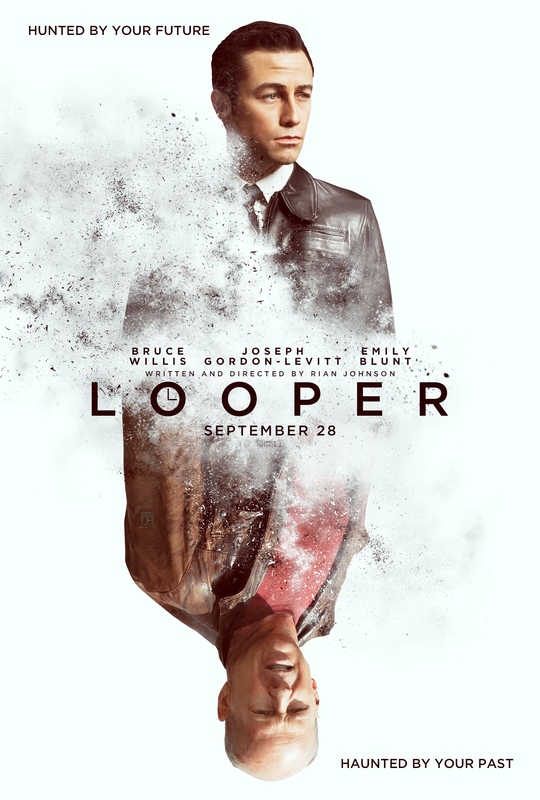 As in Brick, Johnson whittles away many of the common assumptions of his genre of choice in Looper, while defamiliarizing those elements he retains. The ever-versatile Gordon-Levitt is game for anything, and leaps into the challenge of embodying a younger Willis (aided by facial prosthetics that increased his resemblance to the iconic Die Hard action star). Unfortunately, the practice of approximating Willis’ laconic directness reduces Gordon-Levitt’s natural charm, which flows more effortlessly through varied verbosity than enforced linguistic simplicity. Willis has some anguished moments over the nature of his quest (he doesn’t know exactly which kid the Rainmaker is, and has to drop a few underaged candidates just to be sure), but is mostly a formidable action puppet in the John McClane mode, especially when unleashed on a full arsenal of automatic weapons. But Looper is all arsenal with not nearly enough at its core worth defending with such firepower. As fantastically clever and promising as Johnson’s time-travel concept is, his payoff is all discharged firearms and not discharged ideas; he shoots his action from interesting angles and with a sharply edited geometry that renders all the murder and mayhem with excitement, but doesn’t provide nearly the intellectual backbone to earn all the violence. As Cynthia Fuchs noted in her review for PopMatters, the most complex and interesting idea in Looper is also the one that is least satisfactorily explored: memory, and its centrality in Old Joe’s quest and his interactions with Young Joe, whose real-time experiences become Old Joe’s memories as soon as they happen. Having set up a complex set of spec-fic rules and possibilities, however, Johnson can’t think of a way to pay them off that challenges generic mainstays rather than simply ventriloquizing them, to adapt Fuchs’ observation. Nor does the sketchy future of obvious economic deprivations does not get mined for much social or cultural critique by Johnson (what we’re shown comes across as the boilerplate dystopian assumptions of a social context of economic anxiety), who seems more absorbed by the visual details of leather jackets, hoverbikes, and guns, guns, guns. Like Johnson’s debut Brick, Looper is built on a solid foundation of stunted adolescence that is merely adorned with the referential crenelations of pop-cultural sophistication. This made plenty of sense in Brick, and indeed was sort of the point of that film; it was about adolescents, after all, teens who become enmeshed in the dangerous deceits of a very adult crime ring whose violent consequences reached well beyond their tender experience. 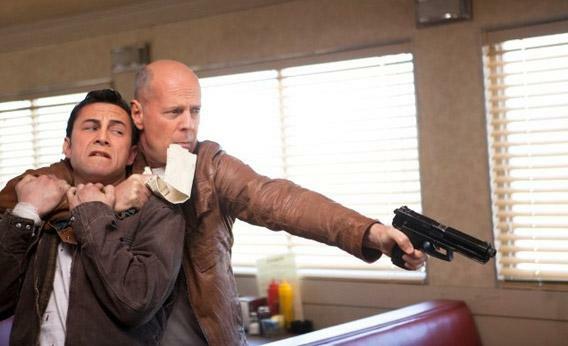 In Looper, this same metaphoric core seems like evidence of a low rate of artistic growth. These characters are adults but remain stuck fast in the quicksand of boyish power-fantasies. This, again, may be Johnson’s point; in his view, behind every violent thug is the careworn absence of a missing mother, and the assurance of feminine stability is what both Joes and the young Cid crave and appear to require in order to follow the moral path. But behind the time-travel theorizing and generic cross-referencing, Looper is about boys with toys beating each other at marbles. Johnson closes his movie’s loop instead of letting it run, and as an unfortunate result, his path is a circle.